Argan Oil Super Creamy BodyWash Precious Moroccan Argan Oil with 4 other nourishing oils For radiant and renewed skin Indulge your skin and senses with this caring Argan Oil Bathing Collection infused with unique Argan+ Synergy, rich in nutrients and vitamins. 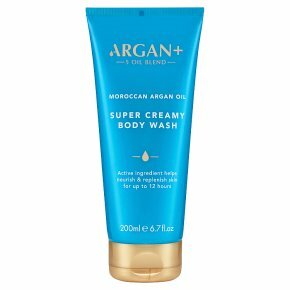 Cleanse and awaken your skin with this rich, creamy body wash combining moisturising Moroccan Argan Oil with Shea Butter. The ultra-gentle formula trans forms into a luxurious, moisturising foam to leave your skin totally pampered and renewed. Argan + Synergy is an all natural 100% blend of precious Moroccan Argan Oil with 4 other amazing oils: Baobab, Kukui, Moringa and Sacha Inci, all selected for their restorative, regenerating and nourishing properties. Directions for use: In the shower, squeeze the body wash into hands and lather up across damp skin before rinsing thoroughly. For even softer, smoother skin apply with a loofah. For external use only. Should irritation occur, rinse well and discontinue use. Avoid direct contact with eyes. If product gets into the eyes rinse well with water immediately.